Here is the long awaited second volume of subjects from the 'Westminster School of Theology'. The content and the format of the book are its strengths - the content is searching, clear, profound and fair minded. Rather than 'duck' an issue R.T. explains both sides of an argument - showing its history and logical development. The book is laid out in outline form. This enables you to see the clear pattern of the source and development of a doctrine whilst accessing the information as succinctly as possible. 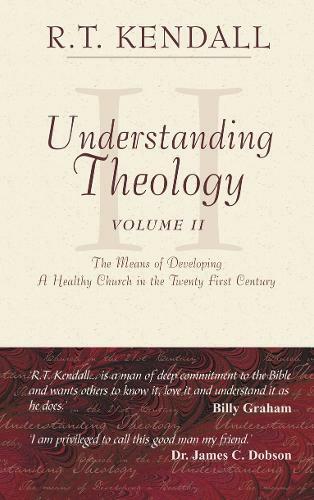 "Dr Kendall is convinced of the importance of all Christians being able to understand basic doctrine. Hundreds gather on Friday evenings to learn about 'Theology made simple' at his Westminster Chapel School of Theology. His lecture notes have now been brought together to give a well-rounded and accessible understanding of the major Christian doctrines. This book is for pastors, church leaders, students and all Christians who feel that the time is overdue to come to terms with theology but who have found it boring and hard. 'R T' strives not only for simplicity but balance: matching the practical with the cerebral, the Spirit with the Word." "R T Kendall....is a man of deep commitment to the Bible and wants others to know it, love it and understand it as he does." "A wonderful opportunity to get to grips with the essential truths of the Bible. Suitable for church leaders, students and all those who believe that scripture and the Holy Spirit can change lives today." Understanding Theology I-III- Who should have these books? Buy them for lay preachers and Sunday School teachers known to you. They will be immensely helped by them. If you are a minister or somebody else with theological training, you may think them too simple for your own bookshelves, but are you really sure of that? I have had the privilege of teaching theology for 52 years but I am very glad to have these now as additions to my own library. I may keep a book-shaped gap next to them, in case there is a forth volume!